I love shower gel. I love H20+. I love gift sets. And I love a good deal. So is it any wonder that I simply had to have the H20+ Bath Basics Shower Gel Favorites Gift Set? 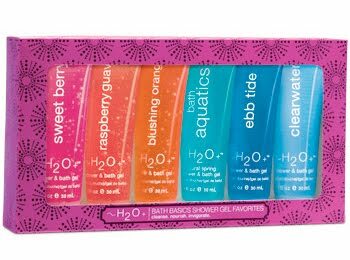 I love that this set contains six of H20+'s bestselling shower gels -- Clearwater, Sweet Berry, Ebb Tide, Blushing Orange, Raspberry Guava and Bath Aquatics. One is more colorful and gorgeous smelling than the next ... not to mention each one is in a conveninet 1 fl. oz. travel size that makes them absolutely perfect for travel! I bought this gift set at Ulta, but as it's not available on their website, pick one up for $9.45 at h20plus.com. This is not a giveaway. There are not any more giveaways scheduled at this time. Thanks for reading!